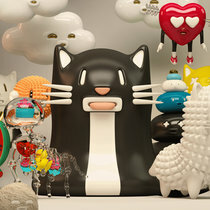 Mr Kat & Friends is a characters world created by art director and visual designer Jaime Alvarez. The warm, graphic character designs are brimming with kawaii and are intended to communicate tenderness, playfulness and happiness. Together they live happily in an imaginary design-driven universe.